Chinese New Year 2019 is nearly here! Celebrated by around a sixth of the world’s population, it’s a huge festival that’s all about being with family, fresh starts and waving goodbye to the colder weather – what’s not to love? #1 Chinese New Year (also known as Spring Festival) marks the beginning of a new year on the traditional Chinese calendar. #2 There’s no set date for Chinese New Year, but traditionally, it is celebrated for 16 days from New Year’s Eve until the Lantern Festival. This year, Chinese New Year falls on February 5th. #3 Every year starts a new animal’s zodiac year. This year it’s the Year of the Pig! #4 Red is the colour of the occasion. Billions of red envelopes containing money are gifted as a symbol of good luck and prosperity. #5 Daily tasks such as sweeping, taking out rubbish and cutting hair are avoided during this period as they’re seen as throwing away good fortune. We have a feeling the Year of the Pig is going to be the best one yet, and so do our brands! 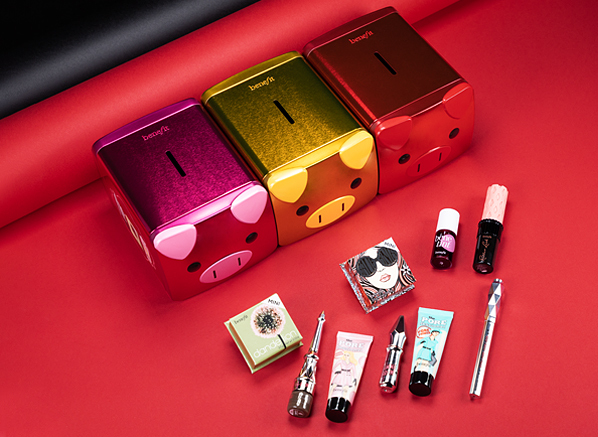 Find out how the likes of Benefit, GUERLAIN, Acqua di Parma and GIVENCHY are marking this special occasion in our Chinese New Year Gift Guide. • These 3 Fragrances Will Bring You Luck! This entry was posted on Wednesday, January 23rd, 2019 at 6:05 pm and is filed under Gifts. You can follow any responses to this entry through the RSS 2.0 feed. You can skip to the end and leave a response. Pinging is currently not allowed.